My family needed to find a facility for our brother on very short notice. We met with Kevin, Janet and Nate. They could not have been more accommodating. They explained everything we needed to know clearly and accurately and followed up on and did everything they said they would do. My brother was in his room, which was bright and spotless, two days later. Things could not have gone more smoothly. The aids and nursing assistants were extremely pleasant and attentive in every way. They were helpful in every way regardless of the time of day or night. They often checked in to see if we or my brother needed anything. Our decision to have my brother stay at Sunrise is one we would make again in a heartbeat. They were outstanding in every way. Sunrise at Reston Town Center was really nice. It's a little fancier than the other place, a little more expensive, and it wasn't as light. It was more subdued, but it's a perfectly good facility. It has some features that some places don't. If Mom was more ill, I might have gone there, but she isn't. The people who assisted me were great. They gave me a little gift from their chef, and it was really good homemade granola. I didn't see any activities there, but the facility was beautiful. We visited Sunrise at Reston Town Center. It was not as good as other places, and their management was not very involved in running the facility. They had a big TV on full blast and loud, and the staff sat on the couches and discussed their private business. The dining area was a little roomier, but the rooms were not that well-kept nor clean, but it was OK.
My personal experience visiting Sunrise at Reston Town Center was very good. I got to speak with a couple different people, but I didn't get a warm fuzzy feeling from some of the people working there. When I was visiting the facility, it was sort of under renovation, so there are multiple areas with a lot of work going on. I saw their schedule of activities, and it looks like it had a good variety. The dining area is very comparable. I just don't think the staff was quite as equipped. The reason why we did not choose Sunrise at Reston Town Center is because it was not close to where my mother-in-law lives, but overall the tour and the staff was very nice and friendly. The staff at Sunrise at Reston Town Center is very caring, pay a lot of attention, and have a number of people available to help my mom. She is having difficulty with feeding herself, so they are helping her with that, and I am very pleased. They have different activities, like singing, games, visitors for events, and holiday celebrations. I am pleased with the things that they do for my mother. Everyone appeared nice at Sunrise at Reston Town Center. However, their parking was setup was awful. You drive up to the front, and there's absolutely no parking. There's a lot across the street, so you have to park down around the back. The rooms looked exactly the same as in every other Sunrise. They made them neat and attractive. I didn't like this facility because they didn't include people in memory care in the events that happen in assisted living. It was more expensive than the other one due to its location being close to Reston Town Center, which people would want to be near. My mom moved into the main floor, the assisted living area, about 5 1/2 years ago. She eventually needed to be moved down to the reminiscent unit, locked dementia unit. The transition was smooth and she is very happy down stairs too. The staff has far exceeded any of my families expectations and has become an extention of our family. I thank God we are able to have her there with staff that truly love her. I wouldn't want her anywhere else, it is beautiful and clean too. Sunrise is wonderful. My mom has stayed there for a month now and is doing well. The staff is great, and the nurses are wonderful. I don’t have anything negative to say. My father was at Sunrise at Reston Town Center. It was recommended by a friend. They were very nice and very helpful. The rooms were very clean, very modern, and very nice. We didn't get much of a chance to enjoy their activities though; my father died within two weeks. However, I was impressed at how clean the facility was, and the staff's work attitude was very good. We have visited Sunrise at Reston earlier. That place is fantastic. The staff has the best caregivers we could imagine. The one she was in previous to this was not anywhere near it. It was 800% better to go to Sunrise. The rooms are fine and clean. There is a lot of room for people to move around. The dining room looked nice. There were all kinds of activities, and they have things scheduled throughout the day. But my mother-in-law did not participate in any of them. She was unable to or didn't want to -- one or the other. The people impressed me the most about Sunrise. My mom has moved into Sunrise at Reston Town Center. We put her in there because it offers good programs. The facility is modern and clean. The staff are competent, and their food is good. They have different amenities there, like they have a library and a TV room. They also have people coming in to do certain things. We moved our mom to Sunrise of Reston, and it is a pleasant place for my mother. We chose it because it is a very nice facility. It is clean, bright, warm-looking, and very well maintained. The staff is wonderful. They are caring, friendly, and helpful. We chose it also for its proximity to our house. However, the biggest downside is that it is a privately owned facility, and it is very expensive. The food is institutional, but it is OK. Some of it is good, and some of it is not. The food could be a little better. This is my only experience with any senior living community; both of my parents have lived there for exactly 5 months. I'm very, very happy with our experience. I know my parents are too, although Mom might not admit it! I can't say that everything is perfect - sometimes they never answer the buzzer or not for too long. sometimes they forget the 2nd laundry basket. things like that. As far as I know, it doesn't happen enough that we can't deal with it. I know that my parents are unlikely to go before their money does, so I am going to have to move them, and that thought kills me. I'm not expecting to find a place that we all like better. But I have no regrets about the time they have spent there and the dollars spent that our family can't really afford. We were in a position that we needed to get them somewhere fast, and putting them close to where I live has been invaluable to the experience. Sure do wish they could stay there for good. Sunrise is fabulous. It is a wonderful community but it's very expensive. I chose it because I had to do something in a very, very big hurry. The staff is really good and everyone is very helpful. The single suite room is absolutely spacious enough. They had high quality, restaurant style table service. There are really good activities that my father can partake in. They had craft, movie time, bingo, outings and exercise. I moved Mom up to Sunrise at Reston for 41 days and we moved her back to where she was before. It was not a good experience at all. The facility is absolutely beautiful and the facade was great. The sales staff and the front desk staff were fabulous. They maintained a really positive attitude about what's going on and they're very friendly and upbeat. But when we got her into her beautiful room, she was not receiving everything that she was used to having. They did not give her medicine on time and that kept her upset all the time. She would ring for help and no one would come for 15 or 20 minutes and so she was anxious for the entire time she was there. Probably about 3 weeks into it, I simply made the decision that we would move her back down. The facility didn't make any effort to make her feel safe or welcome. I would never recommend it to anyone with a parent who really has a need for a lot of care. My dad has been living here for close to a year. It was a very difficult transition, since he was in an unfamiliar place, but the aides, nurses, administrators - everyone, were very supportive to our family, as well as to my dad. The let him vent when he needed to, let him cry when he needed to, and continue to help him with his daily activities. Their daily care for him is outstanding, even when he is a very difficult resident. Very stubborn, and sometimes combative during his most confused days - but, everyone seems to take it in stride, and have learned his behaviors to redirect him when necessary. I would recommend Sunrise to anyone who finds themselves in the same position as my sister and I - trying to find a respectable, clean and trustworthy place to leave a parent, when there is no where else to turn for care. The experience was really awesome! Unlike the other nursing home that i went to, the staff at this one were lively which reflected on the patients there. None of the elderly people really looked like they hated the place and most of them were pretty lively. It was like a big community over there. Like I said before I think the staff was generally the best thing there. They weren't up tight about a lot of things and helped the elderly patients with a smile on their face. None of them acted like it was a chore that they were doing or irritated that they had to do their job. They had a large staff to keep an eye on all of their patients, but for the most part they let them be independent to an extent. None of the elderly people complained about the place or even the food. As for the place, It was really big and had open spaces for the patience to sit and socialize. Overall, it was definitively an amazing nursing home, with a great staff, and lively patients. Located just minutes from Reston Town Center next door to the INOVA Emergency Care Center and across the street from the Reston Regional Library, Sunrise at Reston Town Center sits three blocks from Reston Hospital and within walking distance of restaurants and shopping centers. We pride ourselves in our mature, experienced staff and our extensive activity program including oil painting, cooking, walking club, flower arranging, bridge and canasta, poker, Bible study, kosher breakfast and Scrabble. We also offer weekly outings to restaurants, shopping centers, museums and entertainment venues, as well as on-site medical care by specialists. Step into a Sunrise Assisted Living community and you can?t help but feel at home. We stop at nothing to make your experience warm and inviting, from our homelike exterior architecture, to our comfortable community areas and choice of suites to our exceptional outdoor gardens and landscaping. Look around and you?ll notice fresh flowers throughout the residence, and you may even spot our dog or our cat. And of course, there are always the friendly smiling faces of our staff to ensure that each day spent here is a welcome one. 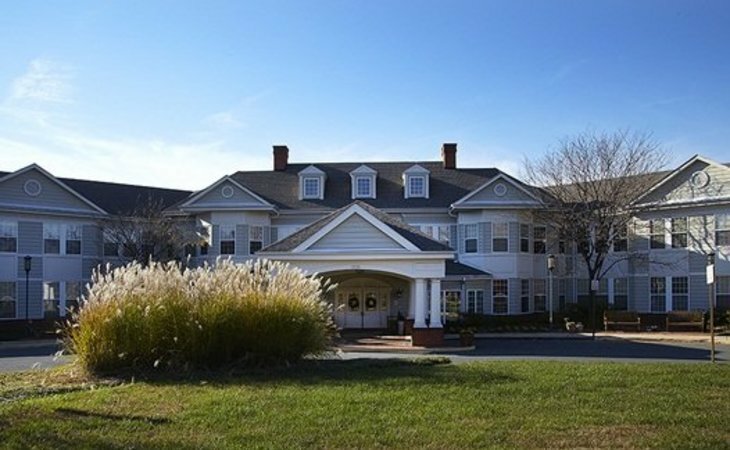 Sunrise is ranked "Highest in Customer Satisfaction among Senior Living Communities" in J.D. Power's first ever Senior Living Customer Satisfaction Study. In addition to earning the highest overall customer satisfaction in J.D. Power's study, Sunrise achieved the highest score in five out of the six study factors. Sunrise ranked highest among its peers for caregiver/staff, which examined customer experiences with responsiveness, concern for needs, professional skill and appearance. Sunrise also ranked highest overall in senior services/activities; resident setup/orientation; rooms, building, and grounds; and food and beverage. What should caregivers and potential residents know about Sunrise at Reston Town Center?